A Time To Be Thankful! Thanksgiving is a joyous time when many of us in the United States spend time with our families and eat a gigantic Turkey dinner feast! Some of us will even see distant relatives whom we rarely see and it's a truly special day and if you're viewing this article today then that's something we're truly thankful for! Let us know what you're thankful for this year in our comment section below and have a wonderful Thanksgiving day! Re: Happy Thanksgiving From Our Family To Yours! I'm thankful that Xenoblade Chronicles X releases a week from tomorrow! As a non-American, I am thankful for not having to endure the horrors of a turkey coma on the last Thursday of every November. 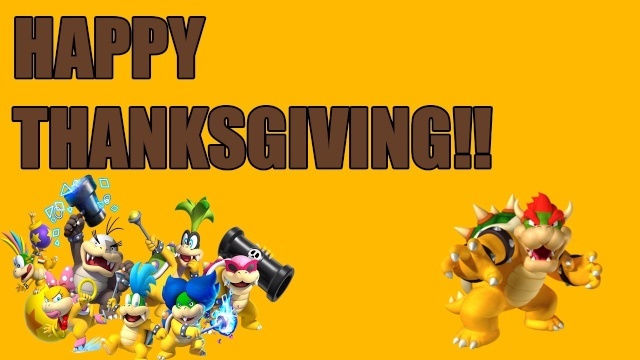 @GeekyGamerZack wrote: As a non-American, I am thankful for not having to endure the horrors of a turkey coma on the last Thursday of every November.